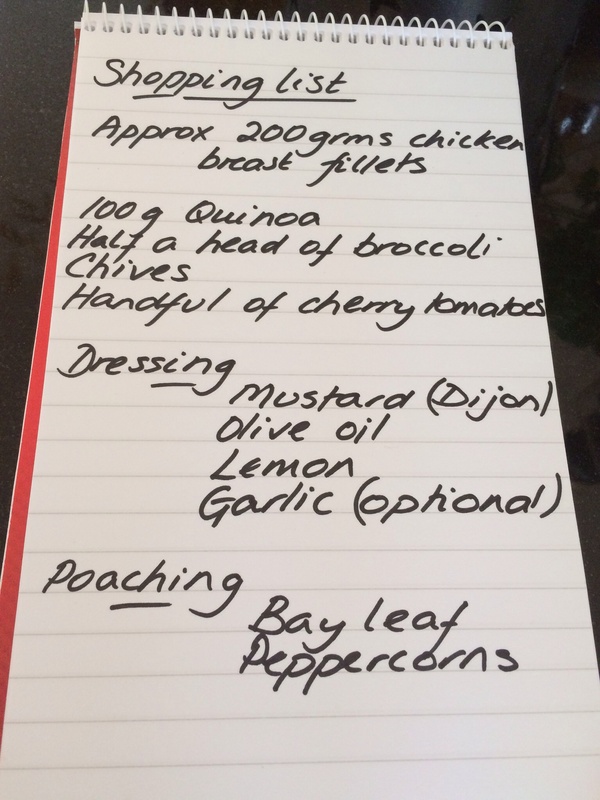 It’s London Marathon weekend and yesterday Rob, a keen sportsman, asked me if I could suggest a high protein low fat lunchbox meal to take in to work. You can make this the night before, eat it for supper even! adding a few more things to it that take your fancy, maybe some feta, some seeds. 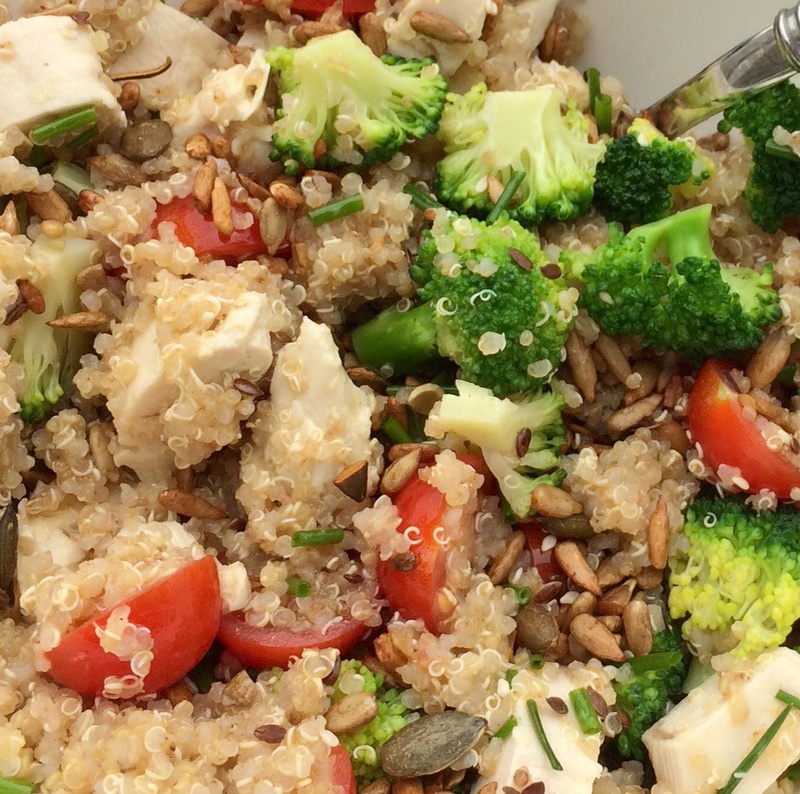 Quinoa is high in protein and low in fat, so I’m going to use it in this salad with broccoli and chicken (which I’ve poached, making it even healthier but of course you can add your own choice of cooked cold chicken). Boil your kettle. Cut the broccoli into really small bite sized florets. Put in boiling salted water for about 1 minute. Drain and allow to dry. If you’re going to poach your chicken, IT IS really easy, put the small chicken breast fillets (or if you’ve got big chicken breasts slice them in half horizontally) into a pan and cover with cold water. The water should cover the meat by at least an inch. Add a bay leaf, 3 or 4 black peppercorns, salt and bring to a steady simmer. Cover the pan and gently simmer for about 10 minutes, then turn the heat off and leave the chicken in the covered pan for another 15 minutes. It’s ready, and it is worth doing this as the meat is very succulent. This can all be happening while you cook your quinoa. Put the quinoa in a pan and cover with plenty of cold water and bring to the boil. Simmer for about 15 minutes til the grains are transparent and tender. Drain. 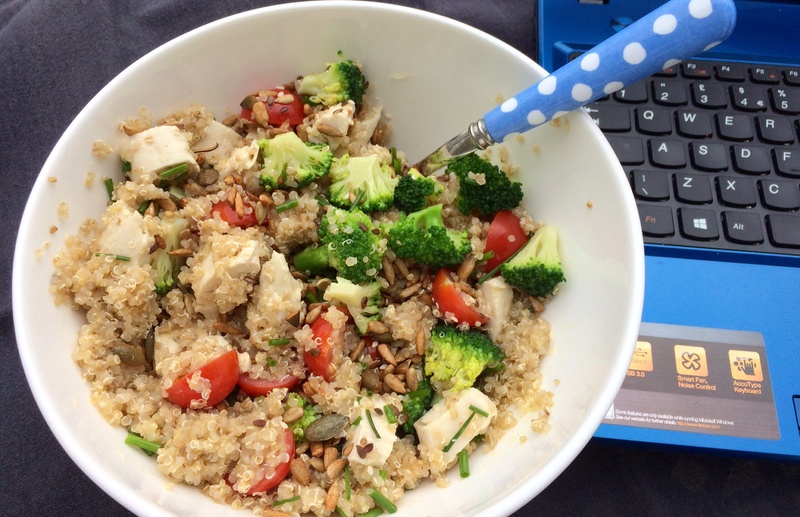 Put the chopped up chicken into a bowl, add the quinoa, the broccoli, halved cherry tomatoes, snipped chives, salt and pepper. To make the dressing mix 2 tsp of Dijon mustard, 5 Tbs olive oil, 2 Tbs lemon juice. You can add a chopped up garlic clove (depends on whether you have a post lunch business meeting!) Pour over the salad and mix up well. Add sea salt and pepper, maybe a sprinkle of seeds. Delicious. I hope you like it Rob!